Bobby Portis was one of the nation’s top prospects just over two years ago. He was, at the time, a 6’9″-and-still-growing McDonald’s All-American. Now, he is a 6’11” sophomore with limitless potential, a certain NBA future and helped make the Arkansas Razorbacks look like the second best team in the entire SEC. 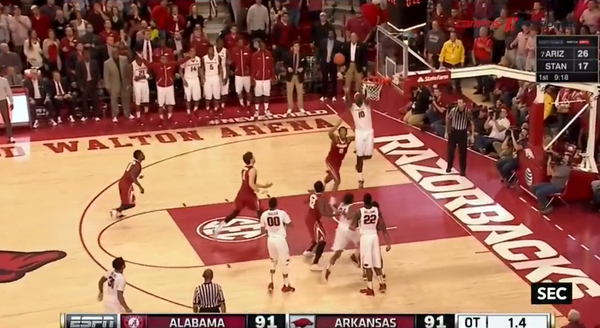 Arkansas’ 16-4 (5-2 SEC) start couldn’t be possible without Portis. The sophomore’s statline reads like an Oscar Robertson Award Finalist’s would: 17.5 points and 8.5 rebounds per outing. He also manages to add an assist, block and steal per game. Bobby Portis is essentially the prototype 6’11” power forward that NBA scouts drool over — for good reason too, and not all of which are directly correlated to his impressive numbers. Now, recruiting reporters already thought highly of Portis back when he was being wooed by nearly every major program in the country. However, his leap from freshman to sophomore year demonstrates just why he’s special. As a freshman Portis averaged a shade over 12 points and 6 rebounds per game, a healthy line from a player most opposing teams are looking to contain. But he’s taken it to another level in 2014-’15 with defenses keying in on him more. That in and of itself may be enough to make Portis a lottery pick. That’s the thing, though. Opposing coaches now know that Portis is a wildebeest. If they didn’t think so when he was a freshman Portis has done enough over the last season and a half that people know that Bobby Portis is the backbone of Arkansas. Yet, still, no on can stop him. If you haven’t seen Arkansas play basketball yet or unaware of the exploits of Bobby Portis let me try to explain him without it seeming like too much hyperbole, because that’s how good he is and you are unlikely to believe me. Portis can face the rim, has a solid mid-range game, has worked to shoot better from 3-point range (without attempting too many), is very active on the defensive side of the ball, is more athletic than most players his size, and he’s not even close to being done as growing as a player — or perhaps even as a person. Put it all together, and Bobby Portis has helped put the Arkansas Razorbacks in a tremendous position. The SEC is in flux with Florida taking a big step back. Only Kentucky has been really consistent play, Arkansas might be the second best team in the league, powered by a star player who is still getting better. Arkansas will not overtake Kentucky as the best team in the league this season, however. It is unfair to compare John Calipari’s eleventy-billion (approximately) McDonald’s All-Americans to the Razorbacks’ — mostly — two-man show of Portis and the much-improved Michael Qualls. Nevertheless, that doesn’t mean Arkansas won’t make some serious noise come March. With Qualls and Portis as their main-men-in-charge, Arkansas also has a slew of solid role players around the two. The result is a balanced attack with the Razorbacks as the nation’s ninth-highest scoring offense (81.7 points per game) and sixth in assists (17.4 per game). Though that would seemingly put Arkansas more prominently on the national radar, the Razorbacks are flying low. That might not sit well with a loyal Arkansas fanbase hungry for respect, but it does bode well for the team come March when the Hogs see competition unfamiliar with their style. So, just like Mike Shinoda of Linkin Park said, remember the name: Bobby Portis. Next article Will 2015 End The Run of Quarterback Heisman Winners?